Apples of Gold proves with this ring set that fancy doesn't have to mean pricey. Two white gold rings make a stunning base for an art deco-inspired creation that won't break the bank. The bands feature detailed carving of swirl-like shapes and each edge reveals a thin beaded line to enclose the design. 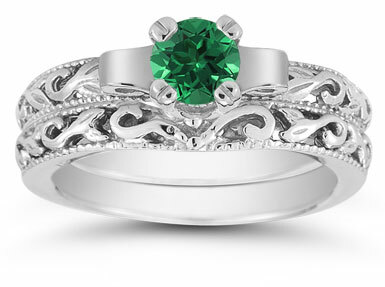 Equally stunning to the filigree work is the rich emerald gemstone that crowns one of the bands. Mounted also in white gold, the 5mm gem will make you gush again and again at the beauty of this ring set. 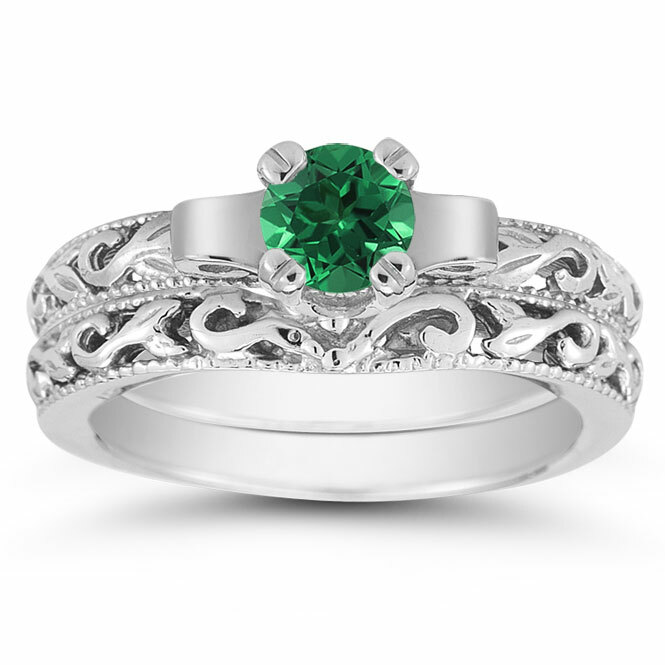 We guarantee our 1/2 Carat Art Deco Emerald Bridal Ring Set, 14K White Gold to be high quality, authentic jewelry, as described above.